When it comes to buying and managing real estate rental properties, my top choice of literature is this book I reviewed here. It is literally called The Book On Rental Property Investing because it truly can be considered the ultimate roadmap for those who are looking to build wealth from passive income made through renting out properties. However, as good as that book may be, I feel that there is one area in its teachings where it is lacking. It is a very useful book in terms of maintaining properties that you can keep an eye on, but it doesn’t go very in-depth on the subject of how to manage properties that are not local to you. This book I review below helps fill in the gaps on that subject perfectly. A big part of making money from real estate is to score a great deal on a property at the time of purchase. Depending on where you live, there may not always be such good deals around, so you have to expand your search area to find a great opportunity. Not every market is well-suited for real estate investment. Some areas can provide tremendous returns on your money, while other municipalities have very little opportunity for properties that will turn a profit. Often times, you may have to go out-of-state to make a good investment. 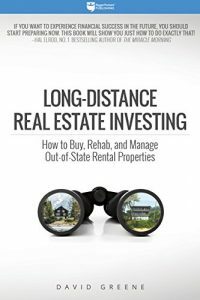 This book, Long-Distance Real Estate Investing: How to Buy, Rehab, and Manage Out-of-State Rental Properties serves as the perfect guide to live where you want, and invest where it makes sense. Just because you aren’t local to the property, that doesn’t mean you can’t own it, manage it, and make money from afar. It is traditionally considered a risky and unwise move to invest in property that is a long distance from you. However, rules and technology have changed that make it more possible and a great investment. Following the guidelines laid out in this book, you can do just that! Just because you reside wherever you are, that doesn’t mean that your location should dictate your potential real estate earnings. This book, unlike other books about real estate, gives you the tools to invest and succeed in any market, from anywhere! David Greene is based in San Francisco and has been active in real estate investment for 8 years. He has experience in buying, selling, and rehabbing rental properties. Outside of managing his portfolio, he is the creator of an investor’s newsletter at GreeneIncome.com.